Wooden pallets, usually used in shipping, can be turned into sleek designs for both for indoor and outdoor furniture. Using basic woodworking skills and a few furniture ideas, wooden pallets can be turned into unique designs for coffee tables, sofas, beds, chairs, patio seating, shoe cabinets, bookcases, kitchen worktops and almost any piece of furniture you desire. Wooden pallets are eco-friendly and can withstand heavy weights and rough handling. Pallets are at best inexpensive and usually free, they look great for both indoor and outdoor furniture. One of the joys of using making furniture from pallets is that a rough, less than perfect build will only add to the rustic, shabby chic appearance which makes this style of furniture so appealing. By using rudimentary furniture-making skills wooden pallets can be re-modeled in to attractive and unique pieces of furniture for any part of your home including the lounge, bedroom, kitchen, garden, bathroom, patio and hallways. The best part of creating pallet furniture is that most of the designs are simple Do It Yourself (DIY) ideas that requires little effort and basic tools. If you are considering using wooden pallets to make furniture here are some easy and inexpensive DIY pallet furniture ideas. 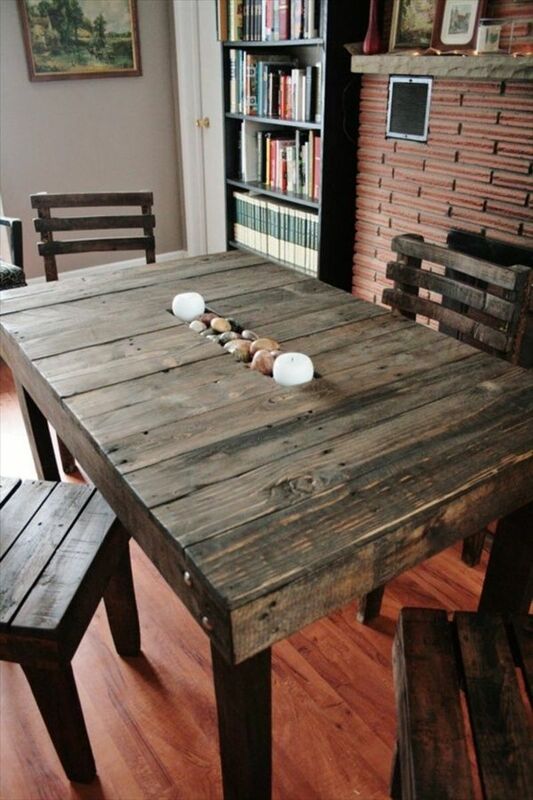 Whether you want to create a dining table or a kitchen table, wooden pallets are particularly useful when it comes to designing dining tables. Wooden pallet dining tables are inexpensive to make and since they are light in weight, you can move them around even for outdoor use just like any other pallet furniture. If you are going to use a wooden pallet table for prolonged outdoor use, use formaldehyde or a paint coating to protect it from outdoor environment including fungal growths. A DIY pallet table is fun to make plus you will have a great satisfaction everyday knowing that you made it all by yourself. Don’t we all love it to have a comfortable couch to relax on, enjoy our favorite TV shows or movies? 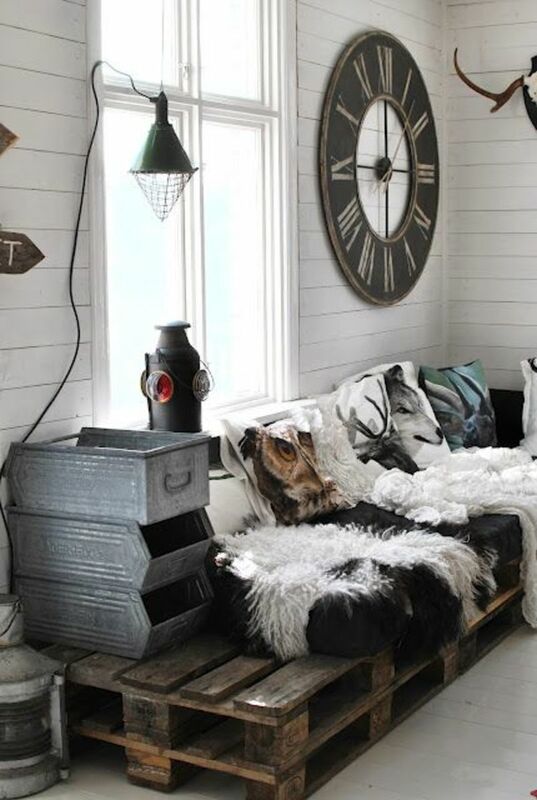 Wooden pallet couches are some of the easy and inexpensive pallet furniture that you can create out of timber pallets. 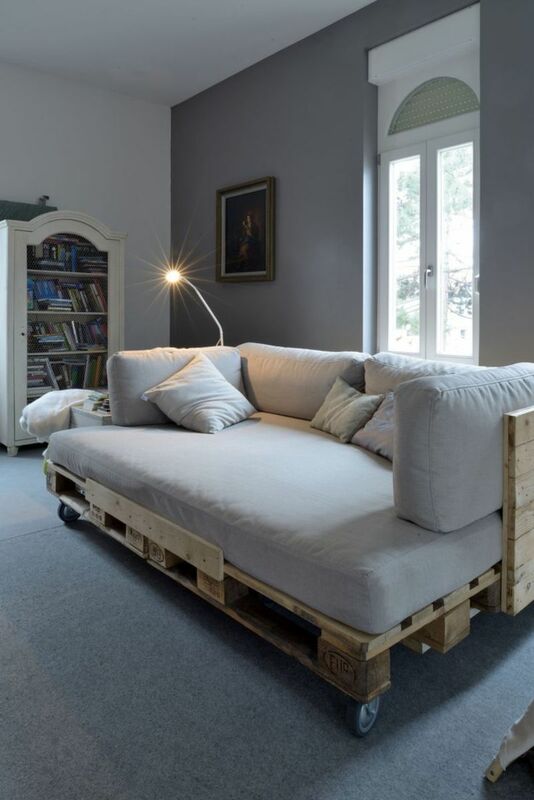 Wooden pallet couches are not only comfortable and unique but unlike other couches, they also have open spaces allowing indoor environment to be airy. For the best and comfortable wooden pallet couch, add some steel feet to make it stable and immoveable then stuff it with feathers and wool to make it cozy and comfortable, finally add some thick cushions and your wooden pallet couch is ready for your comfort. I make interior spaces functional, safe, and beautiful by determining space requirements and selecting decorative items, such as colors, lighting, and materials.